Thomas Bachheimer has been trading at stock exchanges in Dublin, Munich and Vienna very successfully with a special focus on government bonds and commodity derivatives. When the Euro was launched a word by his grandma, „Thomas, this the fourth time that I have to witness a currency reform and every time I have lost everything!“, turned Bachheimer´s attention to currency systems, their inner value, quantitative easing, public debts and last but not least to the ideas of the Austrian School of Economics. 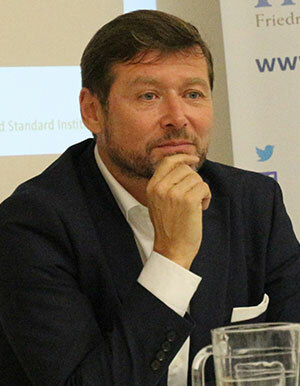 In numerous publications and lectures Thomas Bachheimer dealt with the issue of political intervention in currency developement and in economy. Bachheimer was serving as an analyst of OPEC affairs for more than 8 years for several TV stations, eg CNBC, BBC, n-tv. During this he put emphasis on the colletaration of commodity price and money supply. Being the President of the European Goldstandard Institute his current focus lies on creating awareness of the advantage of sound money and the danger of currency regulation policies. To further the public understanding he shares his insights at www.bachheimer.com.